See how your waste is handled! Tour the Buckman Road Recycling and Transfer Station (BuRRT) and Caja del Rio Landfill to find out why it is important to reduce our waste. Come see first hand how Buckman Road Recycling and Transfer Station (BuRRT) and the Caja del Rio Landfill operate. It will help you to understand why we can only accept certain recyclables, why it’s important to keep them out of the landfill, and why reducing, reusing, and sort at the source at critical. Whether you have a group of school kids or community members in a group or you’re simply an interested community member, please contact us to schedule a tour. Tours must be arranged and confirmed two (2) weeks in advance. Tours are given Tuesdays and Thursdays, 9a – noon and 1 – 4p. Custom times are possible with a four (4) week notice depending on availability. Tours are limited to twenty to twenty-five (20 – 25) participants. 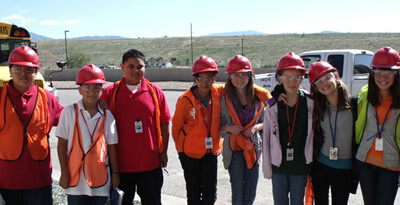 Tour participants are required to wear provided Personal Protective Equipment (PPE) including vests, eyewear, hardhats.